The severity of symptoms varies from person to person and from day to day. Many people have flare-ups from time to time when their symptoms become suddenly worse. Fibromyalgia doesn’t usually have any outward signs, so you may look well even when you’re in a lot of pain. As a result, other people may not appreciate the pain and tiredness you’re feeling. The pain may feel as though it affects your whole body, or it may be particularly bad in just a few areas. Some people find that their pain feels worse in very hot, cold or damp weather. 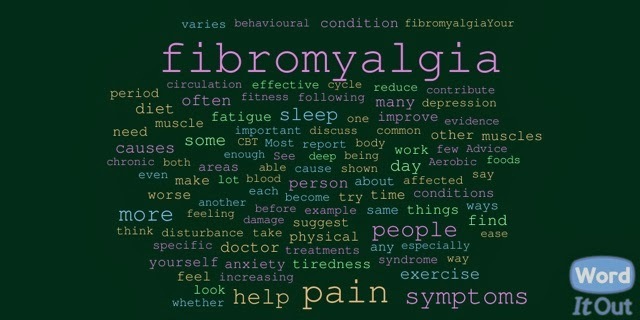 People with fibromyalgia often say that the fatigue is the worst aspect of the condition. irritable or uncomfortable bowels (diarrhoea or constipation and abdominal pain).